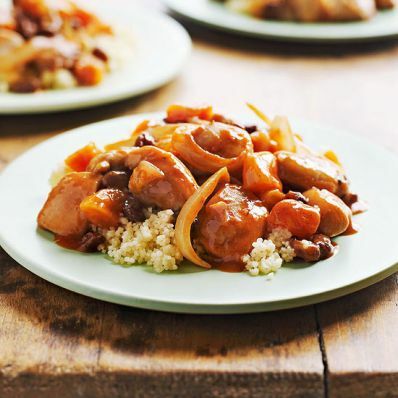 1 of 3 Place chicken, onions, apricots and raisins in slow-cooker bowl. 2 of 3 In a small bowl, whisk together chicken broth, tomato paste, lemon juice, flour, cumin, ginger, cinnamon and black pepper. Pour over chicken in slow cooker. Cover and cook on HIGH for 2 1/2 hours or LOW for 5 hours. 3 of 3 Uncover and spoon over cooked couscous.